Injection Sclerotherapy continues to be the method most commonly used to treat spider and smaller varicose veins and has been the usual patient’s “treatment of choice” for over fifty years. In this procedure, a very thin needle is inserted precisely into the afflicted vein in order to provide patients with the least possible amount of pain, if any at all. A foaming solution, also known as Foam Sclerotherapy, along with an FDA approved medicinal chemical is utilized to treat the vein. The solution works by irritating the lining of the vein causing it to shrivel and stick together. To your benefit, the purple-ish appearance of the veins will lessen or disappear entirely. The treated legs are finally wrapped with a sterile bandage and you will be required to wear compression stockings. This treatment does not require anesthesia, however it may be less effective on the larger varicose veins and has a higher rate of recurrence when compared to many other techniques. Because of this fact, you may need several appointments to complete the treatment. Advancements in Sclerotherapy include the use of technology to guide the injection of the solution into the veins. Ultrasound Guided Sclerotherapy is a modality for treating perforators and painful, large varicose veins. During this mode of injection therapy, a small needle is inserted directly into the vein as ultrasound technology is used for guidance. 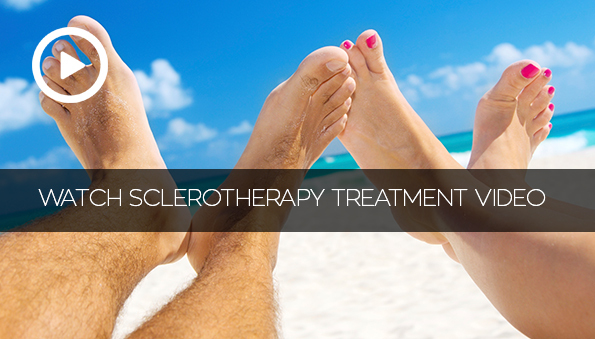 As with traditional Sclerotherapy, there is minimal pain on injection. Next, a foaming solution technique (Foam Therapy), with FDA approved sodium tetradecyl is used. The chemical solution irritates the lining of the vessel causing it to swell and stick together. Ultrasound guidance is a technique that is fulfilled and managed by our professional team in the comfort of our office. The result is a more accurate, non-evasive treatment that aims to relieve your symptoms.